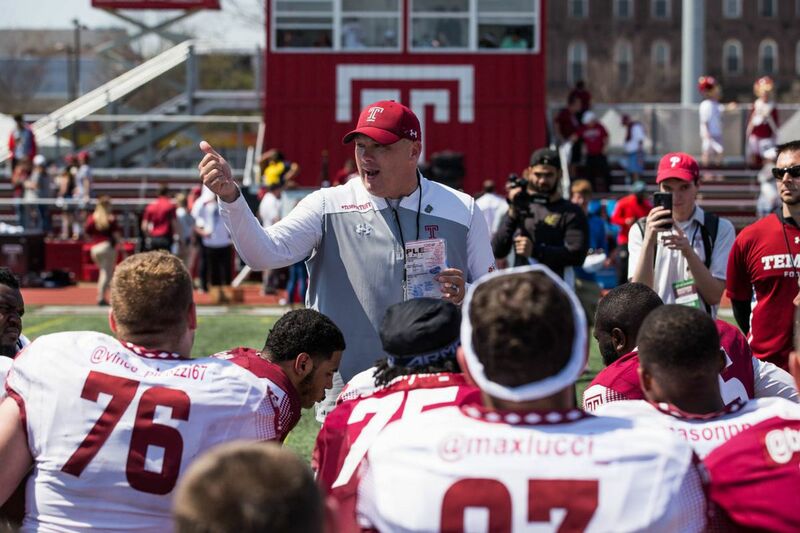 Geoff Collins (shown after his team’s spring game in April) and Temple held their annual football camp this past weekend and picked up a handful of commits. Temple had its first football camp of the spring and the Owls, according to a person familiar with their recruiting situation, received four commitments for the class of 2019. Two players, wide receiver Kwesi Evans (6-3, 190) of Baltimore's St. Francis Academy and linebacker Jordan Magee (6-3, 205) from Dover (Del.) High School, announced their commitments on Twitter. The two other players to commit are defensive back MJ Griffin (6-1, 180) of Saline (Mich.) High School and defensive lineman Josh Fuga (6-2, 320) of Freedom High School in Woodbridge, Va. The camp attracted an estimated 1,000 players. For the second year, there will be an early signing period for football Division-I recruits. This year's dates are Dec. 19-21. The regular signing period is Feb. 6. Last year Temple had 25 commitments after the early signing period and finished with 29 overall.